Tea was first used in prehistoric China as medicine and it didn't hit Europe until the 17th Century, but it's been making up for lost time since then. 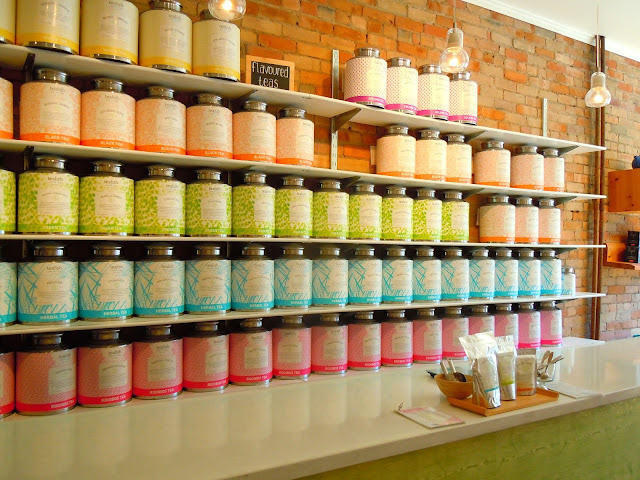 Tealish is a funky new tea shop that opened in 2006 off Toronto's trendy Queen West strip (For those living in the T-dot, it's on a street just before you hit Trinity Bellwoods Park, off Queen St. West). Opened by business and life partners Laura Chodola and Michael Rachmel, the refreshing green-coloured boutique is a paean to tea – rows of tin boxes brimming with fragrant leaves and concoctions of green, black and herbal blends harkening from China, Japan, Sri Lanka and India. "We really love tea … and we wanted to bring it to the masses in a modern way," Chodola told me. "It's not just an Asian or British thing any more. Our store is a way of making it more fun and appealing to a younger consumer." Chodola says she and Rachmel, both in their late 20s, were introduced to the tea universe shortly after university, when they discovered a tea shop and bought several blends. They were struck by the intense flavours and realized how much they were missing by buying commercial tea bags. "Tea is an alternative to pop, juice and even alcohol," notes Chodola. "It's great to brew a pot of tea and have it with friends." Some of the sumptuous blends on offer include Silk Road – white and green teas fused with ginger, anise, cardamom and cloves and the cheeky Kiwi-licious with natural kiwi flavour and a creamy finish. Most intriguing is the Toasty Almond – chockfull of cinnamon, apple and beet root. There's a line of Ayurvedic blends called the "Karma Collection" which includes Peace – fennel, cardamom, anis, ginger and rose petals and the Anti-Stress mix of gingko, St. John's wort, nettle and lemongrass. You can order a cuppa (hot, cold, latte etc…) for between $1.70 and $3.99. Of course, you can also bring home a bag of the leaves. Chodola says she's seen peaked interest in teas – with more repeat customers coming in. I left with the shop's signature Walnut Ave Sencha -- organic green tea with pieces of pineapple, coconut and brittle bits. Smells and tastes heavenly!